Highland senior football players (l-r) Chase Carpenter, Joey Scaffidi and Ian Taylor will all play in college. Carpenter and Taylor will attend Otterbein, while Scaffidi is going to Walsh. 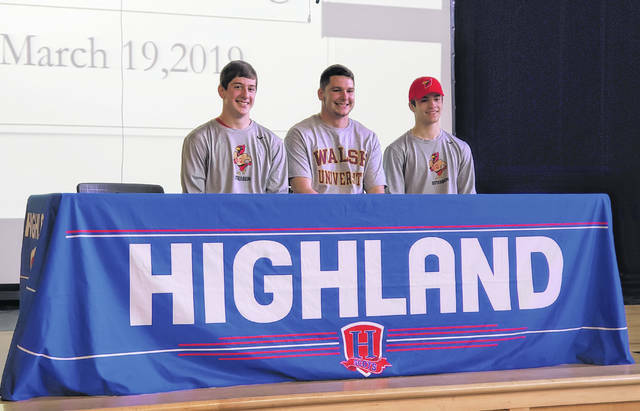 Three members of Highland’s football recently made their college choices official, as Chase Carpenter and Ian Taylor will play for Otterbein University, while Joey Scaffidi will play for Walsh University. Carpenter, who will major in nursing, noted that his choice in major played a large role in choosing the Cardinals. One big change he’ll have to get used to is not being coached by his father, Chad, who had been his head coach at Highland. However, he feels that won’t be a huge adjustment. Carpenter thought he would play at outside linebacker, but said that he’s open to whatever the coaches have in mind for him. Carpenter has a lot of expectations for his time in college. While he’s looking forward to meeting new people, he does know that he’ll be leaving behind a lot of his former teammates and friends. One teammate he won’t be leaving behind is Taylor, who also is going to Otterbein to major in mechanical engineering and will room with his Highland teammate. Taylor will play at defensive back after splitting between there and quarterback with Highland. He noted that his time as the team’s signal-caller helped him become a better defender. From going to camps and making visits, Taylor quickly came to the conclusion that he would like his new teammates. Taylor had been at Big Walnut before moving to Highland for his senior year. While only a Scot for one year, he feels that time has been memorable. Scaffidi will major in business while playing on the defensive line for Walsh. With football, Scaffidi feels he’ll need to put in a lot of work to get better, stronger and faster. However, he feels ready for that challenge, as he noted that he matured a lot over his four years with the Scots. The senior will always have good memories of his time with Highland, saying that he feels the school will always be part of his family. Now, he’s looking forward to the new experiences that college will bring. “Being out in the world and seeing new things and still playing football,” he said in saying what he’d be looking forward to. One person who was very happy to be there for their signing ceremony was their former coach, Chad Carpenter, who stepped down as Highland football coach following 17 years and 113 wins with the Scots. Carpenter feels all three of those players has what it takes to be successful, both on and off the field, in college.